BleachHouseLibrary.ie: "A Summer Breeze" by Colette Caddle. Review and 5 copies to giveaway! "A Summer Breeze" by Colette Caddle. Review and 5 copies to giveaway! 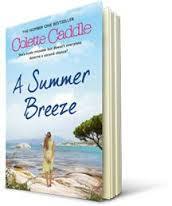 A huge thank you to Colette Caddle for arranging five copies of A Summer Breeze for this Giveaway! To enter, just click on the rafflecopter link below. Open INT. Good Luck! The world of theatre can be a fickle one. When Zoe Hall put her actor husband's career before her own, she made a huge mistake. Now she has returned to Dublin, newly divorced and ready to start over again. With some help from veteran actor, Terence Ross, she auditions for the role of a lifetime and holds her breath in anticipation of its outcome. Meanwhile, Terence's daughter, Tara, is struggling in her new role as the main breadwinner in her household. Her husband's redundancy has affected their marriage and she wonders if she could be bothered fighting to keep it intact. When Zoe's brother, Shane, makes contact with his old flame, things get a little more complicated. This novel looks at the casting of a play written by an Irish playwright and how it moves from the early audition stages, through to script edits and finally, opening night. The main characters are female; Zoe and Tara, but there is a wide supporting cast of males to balance the equation. Tara is a caterer with a damaged marriage and Zoe gives her a dig out on occasion. Terence is Tara's father, Shane is Tara's ex but also Zoe's brother. Then there are a host of guys who are connected via Shane and his play or his childhood. Terence encounters a few old friends along the way too, so there is definitely no shortage of characters. A bit too many when you throw in Shane's fling in Spain, (in his ex-lovers villa) and his old friend, Adam and a quick mention of his housebound mother. A Summer Breeze is published by Simon & Schuster and is available in TPB and ebook format, with PB released on 30th July 2015.